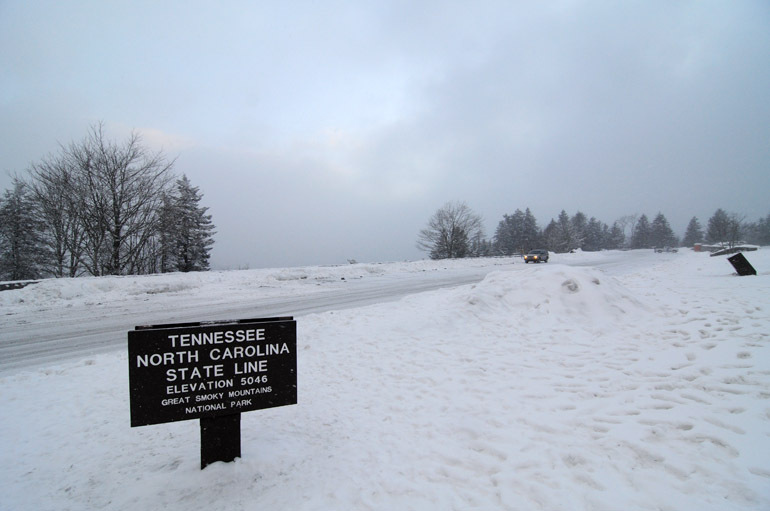 The high point of U.S. 441 over Newfound Gap, in the heart of the Great Smoky Mountains National Park, features the border between North Carolina and Tennessee. I never thought that I'd set foot in Tennessee for the first time while it was snowing. In addition to spontaneous, my long-weekend trip north was foolhardy. There's an advantage to having no plans, no schedule to be at a certain place - a certain hotel in a certain town - at a certain time. I could be deliberate, stop when I felt hungry and take photos if something caught my eye. But having no certain route to follow through Appalachia, where often-dangerous back roads abound, could be considered rash, too. My tack was to avoid using a map and instead rely on my GPS in hopping from small town to small town. When I got to the first town, I'd set a course for the next. My town hopping, I planned, would take me through scenic country and over the Great Smoky Mountains in my first day of travel. From Atlanta, I drove to East Ellijay, Ga., where I stopped at the sight of birds, of all things. 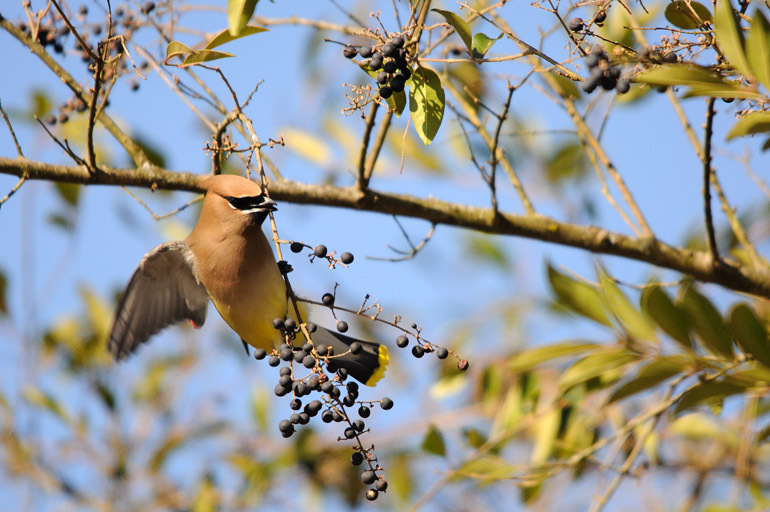 I saw cedar waxwings and robins feeding on berries in otherwise bare trees. I hadn't seen those avian species since moving to Florida. 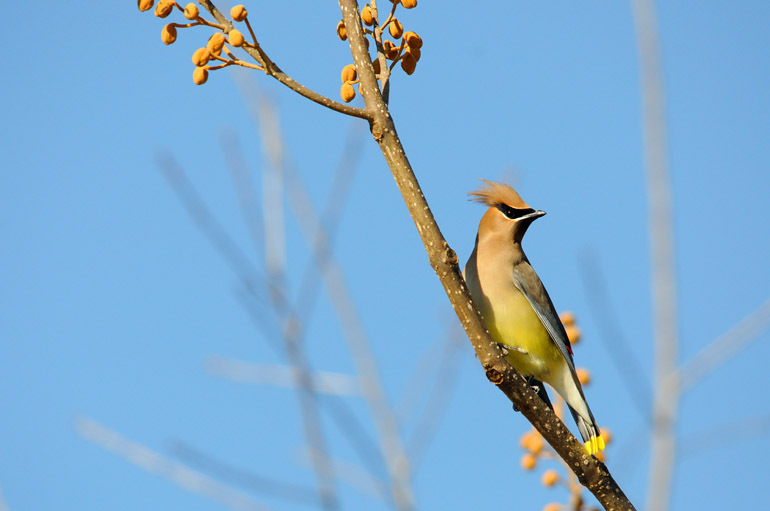 I hadn't encountered a cedar waxwing since leaving Maine, so it was pleasant to see their feathery mohawks in East Ellijay, Ga. The cedar waxwings were not cooperative subjects. I couldn't tell if they were flying around so much to stay warm - likely angry that they had flown south only to be greeted with frigid air - or to gather more berries than their counterparts. 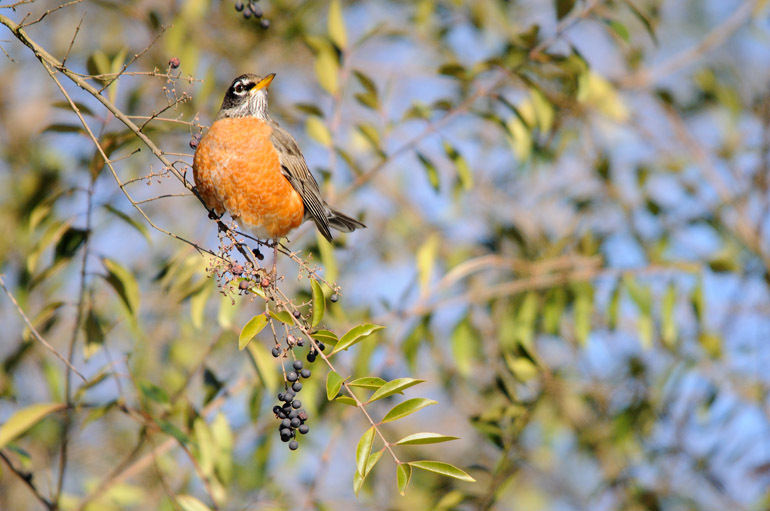 Robins, this one with puffy plumage, are a sign of spring in New England. They are some of the first birds to arrive from the south when the weather warms in places like Maine. When I arrived in the small town of Murphy, N.C., just north of the Georgia line, I had traveled nearly 700 miles since setting out from Melbourne early that Saturday morning. And it was there where I realized the flaw in my traveling strategy. I had picked a random address in Murphy for my GPS to lead me to. I had planned to stop when I reached the town, then reset my GPS for the next city. Unfortunately, I didn't notice when I arrived. I followed a sign onto a road that I thought would lead me to Murphy. But actually, without knowing it, I had already traveled right through the heart of Murphy. (It was so small, I didn't even notice.) Instead of stopping, I continued to blindly follow my GPS. I should have known there was trouble when I saw the route I was following was called Beaver Dam Road. That's not a name you'd see in downtown Manhattan, Miami or even downtown Murphy for that matter. 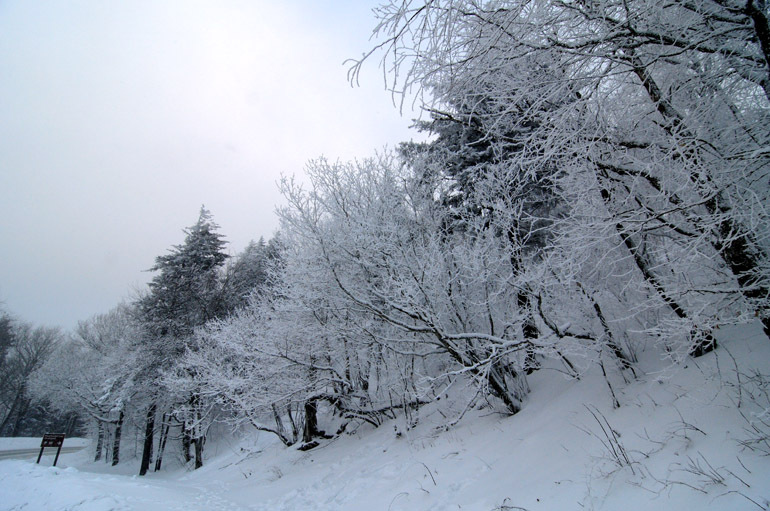 It wound over low mountains, around cliff faces, next to rural farms with horses grazing in fields sprinkled with snow. The road surface was barely maintained. Salt had melted some of the snow that had fallen earlier, but what was left was a dirty slush. And none of the scenes were particularly photogenic. There wasn't enough snow to make the bare trees pretty. Once, I saw a beautiful hawk perched in an evergreen, backdropped by a distant farm in the valley below. But me exiting the car spooked the bird, and it flew off. My patience was wearing thin. I wasn't lost, but I wasn't where I wanted to be. None of the scenes were particularly photogenic. There just wasn't enough snow. 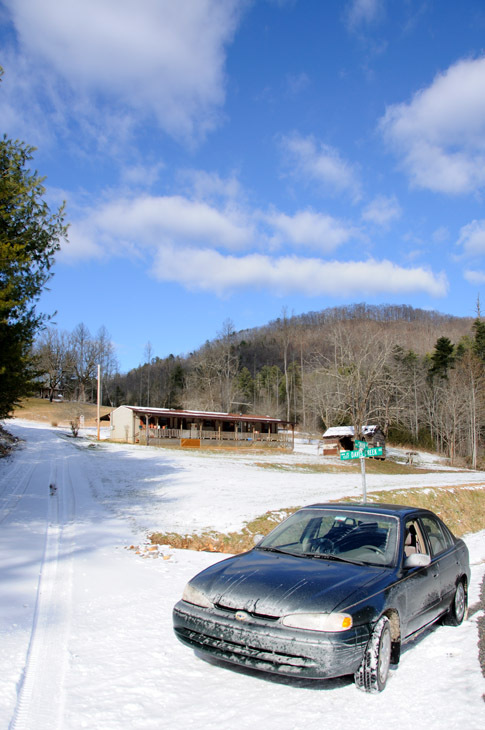 Many of the homes along Beaver Dam Road near Murphy, N.C., had been abandoned for the winter. If I got stranded, I figured I could break into one, start a fire and roast some of the Ritz crackers I had brought along for the ride. The only salt my car is accustomed to in Florida is in the air that pushes off the ocean. After this trip, a good wash would be in order. At this point on Beaver Dam Road, I stopped. But I had gone far already, so I figured I'd push forward to see where the road led. At least traffic wasn't a problem. I met no one on Beaver Dam Road. In fact, most of the cabins had been abandoned for the winter. And of the homes that were occupied, none of their occupants were going far: I could tell the snow was alien to them. 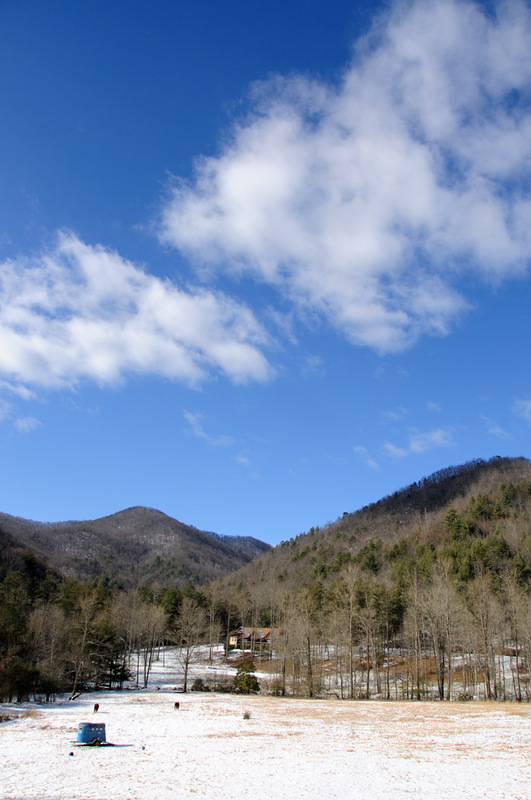 My drive took me through the part of Nantahala National Forest that most tourists never see. After all that, though, my luck ran out. I came to a one-lane bridge, on the other side of which was a sign that said "end state maintenance." The road beyond it was dirt, unplowed and undoubtedly littered with downed limbs. I cursed my GPS and headed back to the town I never saw. After realizing my error and correcting it, I set course for downtown Bryson City, N.C. - rather than some random address off in the boonies. That took me over the Great Smoky Mountains Expressway, which was much smoother and slightly less snowy than Beaver Dam Road. Occasional turnouts along the roadway allowed me to once park and trudge over an embankment to a small stream. Park rangers don't much care for tourists who go off the trail, so I remained discreet. The whole intent was to photograph ice formations on a mountainside. In order to get closer, though, I'd have to cross the stream by way of icy rocks. But that seemed beyond the scope of my daring, so I snapped one shot and fought the bushes on the way back to my car. I stopped again when I crossed the Little Tennessee River. 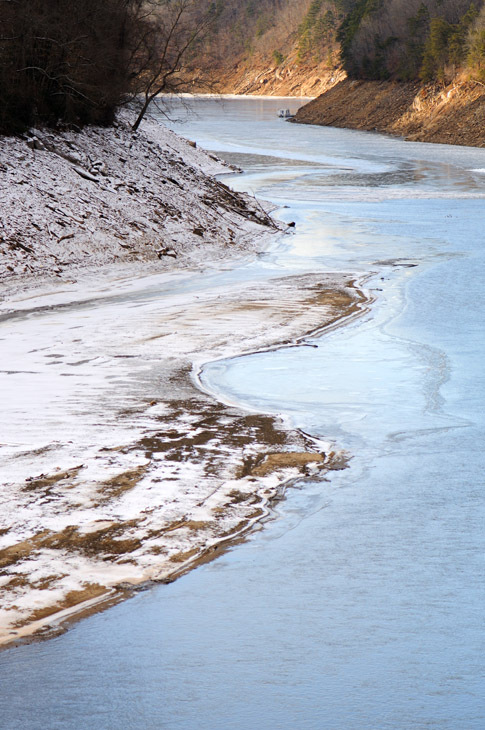 The surface was icy and turquoise. Under better lighting, it would have gleamed. But none of the photographic gods were with me on this trip. I trudged on. 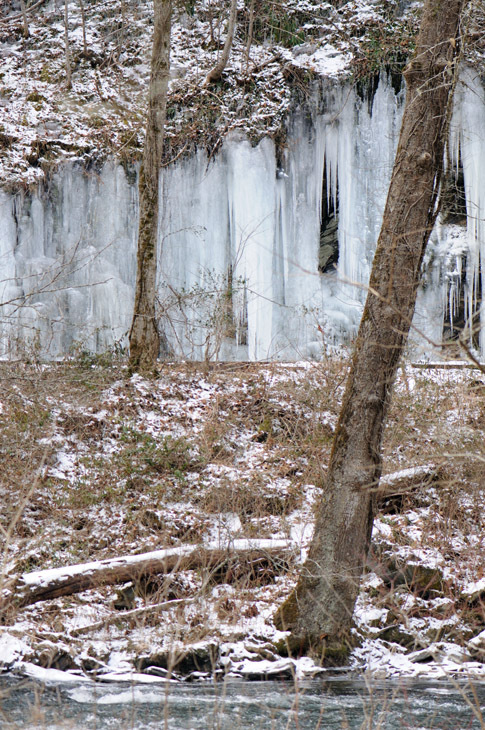 Water running off cliff faces through the Nantahala National Forest and the Great Smoky Mountains National Park froze into masses of ice. In some places, they reached down and kissed the pavement of the expressway. The lighting is downrange from my lens in this shot of the Little Tennessee River in North Carolina, less than ideal for a good photo. At a general store, I bought a chocolate milk, which served as my lunch, or my dinner. I lost track. At that point, about 4 p.m., the exhaustion from traveling all day set in. I had consumed countless Red Bulls and a few cups of truck stop coffee. All that caffeine, I'm sure, worsened my condition in the long run. The terrain started to get serious. The mountains were higher. 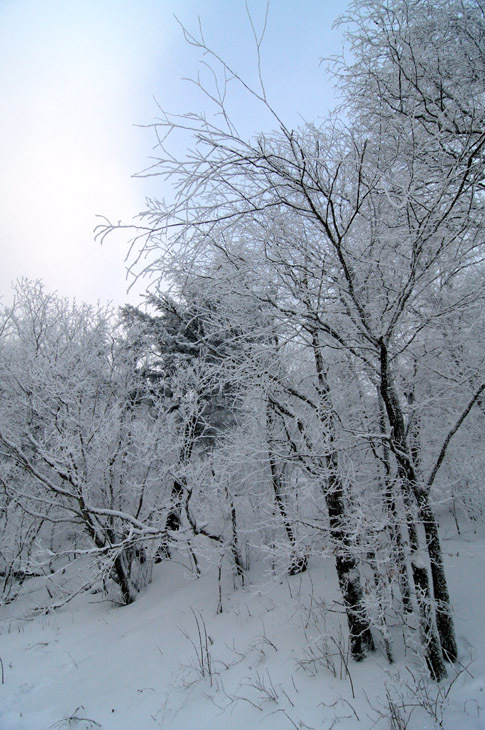 The trees at their peaks were coated in snow, which glimmered in the sunshine. The roadway itself was in shadow. When I entered Cherokee, N.C., I was so tired that there really was no sense in even possessing a brain because it was not functioning. 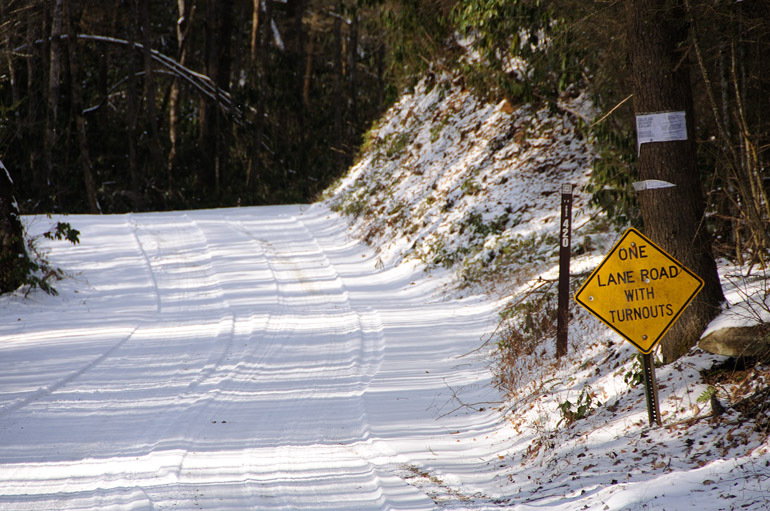 Flurries started to fly, but I "made the decision" to traverse the alpine U.S. 441 connecting Cherokee to Gatlinburg, Tenn. I passed the entrance to the Blue Ridge Parkway, which was impassable, thanks to unseasonable weather. As my faithful car scaled the Smokies, the snow fell thicker. The sun peeked through occasionally as it set, allowing fleeting moments for photography. 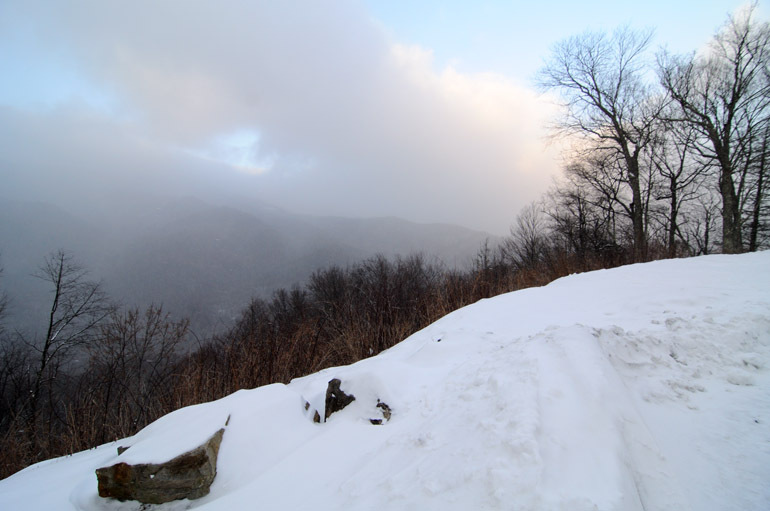 These clouds over the Smokies dropped a good deal of snow in a short time, but the sun often shined through. You can tell from this photo that the road was quite snowy. Though it doesn't seem the case in this photo, snow is falling during a squall. 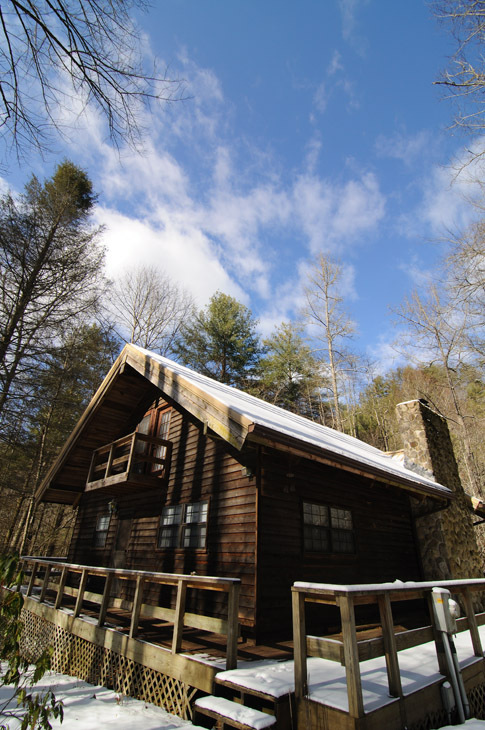 This was high in the Smokies, where there was a foot of snow already on the ground, with the trees covered from previous storms. At the apex of 441 is the North Carolina-Tennessee border. When I reached it, at 5,046 feet, there was a sense of accomplishment, despite having not taken one photo all day that made me happy. I was touching a state, Tennessee, that I had never touched before. Just as I began to savor the moment and to think that this trip is all about the journey, not the destination, I was honked and yelled at by a plow-truck driver who told me to pick a state and get off the mountain. I told him I was headed north, into Tennessee. He said the park was closed because of the worsening snowfall and that I had to go. So I went. Very slowly, but I went. The road curved downward toward Gatlinburg. A manual transmission in these situations is advantageous, as the low gear kept my speed down without a need for the brake. If you know anything about driving in the snow, you know quick braking and accelerating are sure tickets to the snowbank - or, in this case, the bottom of a 200-foot cliff. That was unfamiliar territory: I know snow, but the high mountains in Maine were left to the L.L. Bean boots on my feat, not the Firestone tires on my car. I took it slow the rest of the way. About two inches of white stuff fell in a short time, and I drove 20 miles in the dark. When I arrived in Gatlinburg, I had my life, and all my extremities were safe from frostbite. I ate pulled pork, fried okra, beans and cornbread at a local joint, then checked into a cheap motel. With the heater on high, I slept, though somewhat unnervingly at the knowledge that I was the only person in the motel. 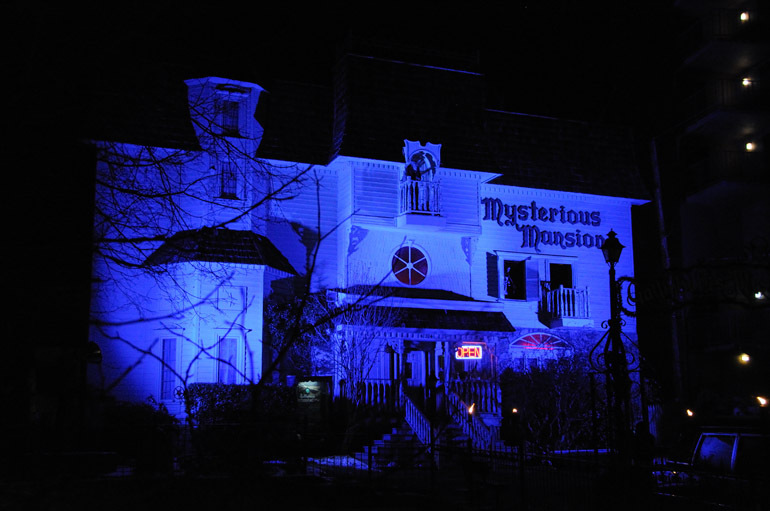 Gatlinburg is a kitschy town with attractions, such as this haunted house, that cater to tourists. A co-worker said it's Orlando with a hillbilly flair. Indeed, there's a downtown strip lined with plenty of hillbilly golf - one named after Davy Crockett and another advertising "guns and golf," a natural pair - and go-cart venues, a place to have your picture taken with the real General Lee and a museum of salt-and-pepper shakers. There was even a Harley-Davidson store, but it was so cold - in the teens - that I didn't want to even think about riding a motorcycle. I liked the town, but I didn't feel like taking many photos of it. I spent many summers in Beaver Dam, KY, where my grandparents lived.